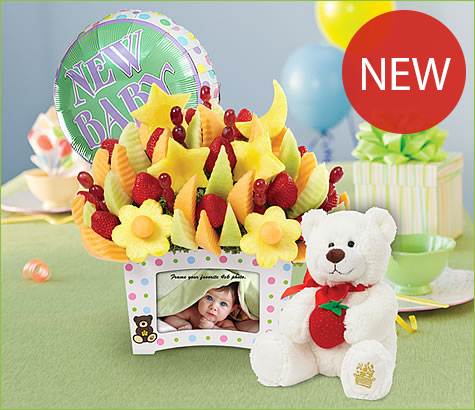 The newest addition to our collection of fruit bouquets is the sweetest way to congratulate new parents on their own new arrival. The NEW First Moments Bouquet™ features a fresh fruit assortment, including strawberries, grapes, cantaloupe, honeydew and adorable pineapple shapes like moons, stars, and daisies. It’s all artfully arranged in a keepsake container that holds a 4x6 photo to commemorate one of your own special moments. Plus, the container also does double duty once the fruit is gone, so you can store baby must-haves inside! Size Shown: Large Container color may vary, and will be either green or white.